Please be informed that what amazes us and astonishes us is not the greatness of Russia (in spite ofits importance), but rather how it maintains the good worship and the true piety. 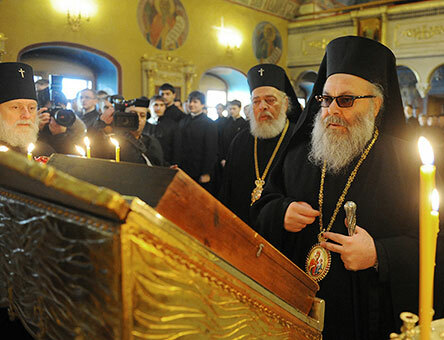 And according to this Christian virtue, God, with no doubts, will keep the Holy Russia, as an unbreakable fortress for the Orthodoxy, that Russia is keeping very well in purity and with great ecclesiastical majesty. May God keep having His mercy on Russia”. That is what the Patriarch of Antioch, Gregory IV Haddad, said in the church of the Lady of Kazan in Petersburg on 06 March 1913. One Hundred years passed, and history and all these kind faces that we meet today prove the validity of Gregory’s words. And the next days and years will continue proving their validity because the glowing faith, which our good ancestor has seen, is still shining in your eyes, my brethren. It is my pleasure to be here among you in the Lavra of Saint Sergios, whom Russia and the whole Christian world are commemorating 700 years of his birth on July 2014. That’s is why, we should consider how our Christian Orthodox theological and academic life gets its origins and gets irrigated, till now, by remembering the holiness. And it gets stronger and fed from monasticism, so that the monuments of academic science get built based on the life of prayer, not merely on studying books. We are invited in our faculties of theology to combine between both ways. We are invited to combine between the piety of our ancestors, their simple faith and theological studies. We are invited to see our future through the experience of the past, and to see the past through the eyes of the future. Piety had a distinct role maintaining faith and delivering it to us either in Antioch or in Russia. On the other hand, theology played a significant role supporting faith and strengthening it. Piety of our ancestors, as called by some, their jealousy is the factor that kept our orthodoxy from generation to generation. And I, hereby, give you a real example I faced personally. A person who belongs to a “Christian group” came once to one of our towns in order to sell a calendar aiming to gain our believers with their simple faith. The grandson took the calendar and handed it to his grandfather who, looking into it, was pleased. Being pious and zealous, the grandfather asked his grandson: “have a look on it and tell me when are we going to celebrate St. John the Baptist this year?”. The grandson looked into the calendar and did not find anything about him, and told his grandfather: “it looks as if St. John has left. I cannot find a signal about him in this calendar”. The grandfather was surprised and handed the calendar back to the seller asking him to correct it, not forgetting to add Saint John the Baptist and all the saints to it. 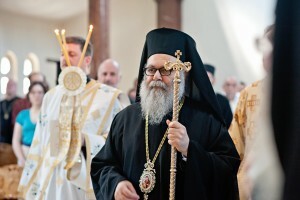 How beautiful is to keep this piety at the middle of these days, and how great is to ornament our institutions of theology and faculties with such simplicity of faith lived side by side with our longing to theological science, and the necessity to know the texts of the Holy Scripture and the Holy Fathers deeper and deeper. Acquiring the simplicity of faith goes side by side with the importance of academic theology. It is worthwhile for a theologian to live theology feeding himself, simultaneously, from the experience of prayer accompanied by studying the books deeper, so that he may reach the Cross of our Lord Jesus Christ. And in the Church history we have many testimonies teaching us how to achieve this compromise. The theological School of Antioch, for example, is the school of the tangible and lived Incarnation. It starts from the tangible getting to the intangible. Our Church of Antioch lived its theology tangibly and practically. Its believers today live this theology and this faith not only on the pages of books, but also on the pages of their hearts. Antioch was creative in its theoretical and theological thinking, giving for example, Theophilos, the first who used the word “Trinity” in its Christian meaning. It gave St. John Chrysostomos who saw in the kin a “divine altar”. It gave St. John of Damascus, the greatest apologist for the Holy Icon. This Church itself was a pioneer in narrowing the distance encouraging to accept the other through its Patriarch Peter III at “Great Schism”. Yet, the Church of Russia supported her sister, Antioch, with a theological education when she was passing a difficult time, unable to open theological schools. From the Academy of Kiev, at the late 19th century, graduated the Deacon Alexander Tahan.He lateron led the See of the Apostles Peterand Paul on 1933 as Patriarch Alexander III. 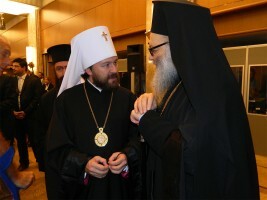 I’m full of hope that we can strengthen the academic cooperation between our theological institutions, so that the Orthodox teachings, based on prayer and piety may remain glowing, emulating modernity, accepting the other, and offering the world of today the life-giving Word. The historical Antioch is the same as the present Antioch, whose people are living a period that deserves to be calledChristianity at stake”. We have two kidnapped bishops, priests, nuns, civilians who testify till now the name of Jesus Christ, and for all the supreme human values on the land that heard first the title of “Christians”. We have homeless people who were taken away of their houses and churches. We hope that through your prayers and efforts, we will be able to see them again among us, safely and as fast as possible, regaining peace that may heal the wounds of our sons. May God give you strength in your efforts, filling you withHis heavenly Grace. I kindly ask you to pray for our wounded Church, and our country which is suffering in order to regain peace and stability. And again, I say with my ancestor Gregory IV: “May God keep having His mercy on Russia”.